Another in my series of collaborations with artists as part of April Pameticky’s 2017 Wichita Broadside Project. 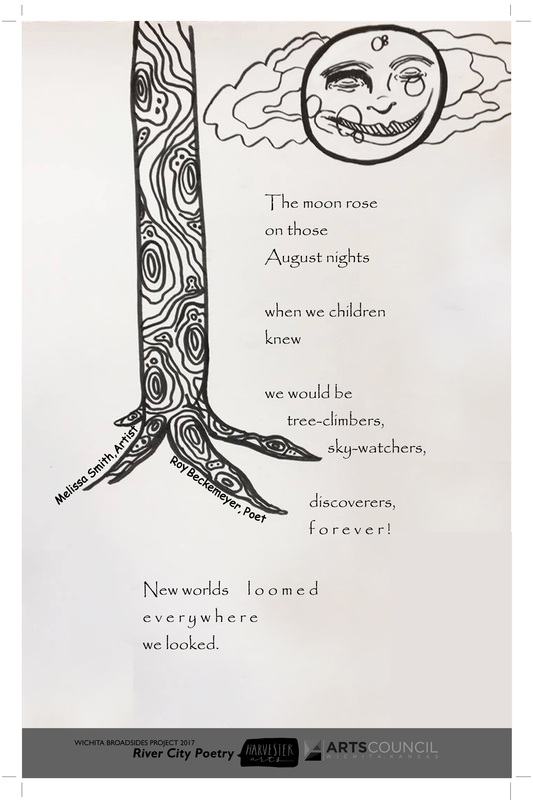 This one, “The Moon Rose,” comprises a poem I wrote in response to Melissa Smith’s delightful pen and ink drawing. It brought to mind children’s book depictions of the man in the moon, and the tree that disappears into the sky high overhead seemed to represent every tree I had ever climbed or wanted to climb as a kid. Broadside art and text copyright by Melissa Smith and Roy J. Beckemeyer. Original 12 by 18 inches with 11 by 17-inch crop lines.